Patients allergic to neoprene can still get the same even compression with this cotton elastic sleeve. Patients allergic to neoprene can still get the same even compression with this cotton elastic sleeve. Two medial/lateral spiral stays provide additional support. I have arthritis in my knee which causes burning on the side of my knee when I do aerobics, will this brace help to allow me to continue to do my cardio workout? 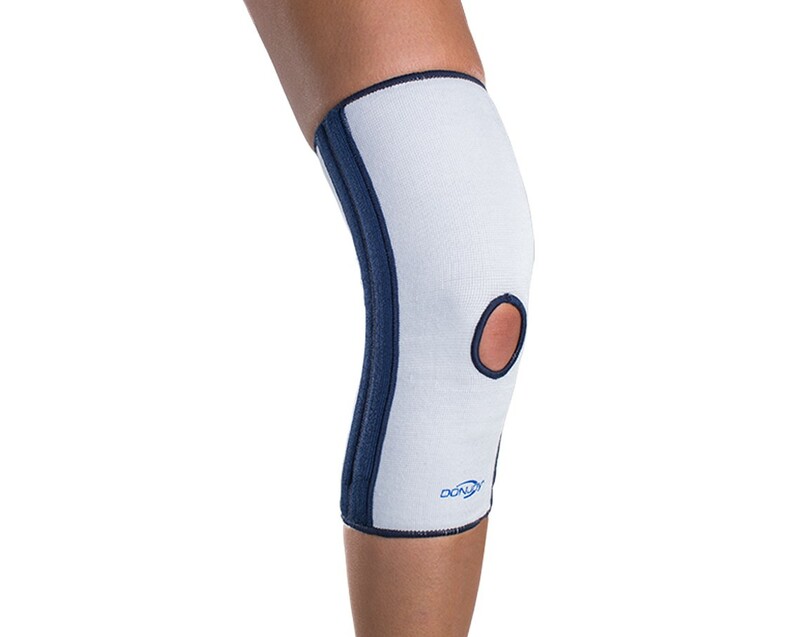 Without a diagnosis of the injury we cannot accurately recommend a brace, but the DonJoy Spiral Elastic Knee Sleeve will will provide compression and mild support. Does donjoy offer an elastic knee support with support springs that are slightly bent at rest. The ones that the stays are straight don't seem to offer me comfort for whatever reason. No Im sorry we do not. I have arthritis and just had a cortisone shot which helped ease the pain in front of the knee. However, did not help in alleviating back of knee pain which is mostly on right side of back of knee.. Hurts more after sitting awhile and then standing. I have an old bulky knee brace and it does compress the back of the knee a bit and it is helping. Like to get something less bulky. I had arthoscopic surgery @ Mayo in AZ. It was my choice not to have complete reconstruction, I also have a complete ACL tear as well as meniscus damage etc. I opted not for the reconstruction because of the 6+ month rehab. No more tennis, jogging or downhill skiing with no ACL, & I guess I'll live w/that. at 5+ miles per outing. SO . . . what type of sleeve &/or brace should I purchase knowing I do not have an ACL but still want to bike & walk. I recently found out I tore the cartilage in my left knee. I haven't found out yet if I need surgery. I also have arthritis and Osgood Slaughter in the same knee. What brace should I look at purchasing as I bowl a few times a week and work out 5 to 6 days a week. There are no restrictions for diabetics wearing the brace, although you do need to make sure that your brace is too tight and always inspect you skin after use. I have a loose MCL, and I use a hinged brace for sports and exercise. I'm looking for a sleeve with some lateral support for daily wear, and I'm wondering how much support does the spiral stays provide. Thanks. The Donjoy Spiral Elastic Sleeve is comparable to a Knee Sleeve used for mild support and compression. It has a Medial and Lateral Upright that is flexible, easy to bend. I recommend this knee sleeve for general wear, with walking. If you need additional support I recommend a Knee Brace with Rigid Uprights. Please call us to speak to a Product Specialist. 1-888-405-3251. Can this brace be worn in the water... For waterpolo? Yes it should be rinsed with tap water after and allowed to air dry. which products on your site contain latex or are latex free? The Spiral elastic knee does not contain Latex. Very few of our braces do. If you have one particularly that you'd like to know we can check for you. Being alergic to Neoprene, but having knee pain when I am at the gym, I was desperate for an alternative. This product has provided the desired support - relieving both the physical and mental pain emenating from working out without a brace. 1) the metal stays prevent the elastic brace from "rolling" down or up (depending on how you look at it.) The brace simply stays in place - excellent. 2) it fits true to size. I've bought "XL" braces that weren't hardly L, but if you follow the measuring instructions and buy accordingly, you shouldn't have a problem. If these had a bit more support, they would earn five stars, but as is - I am nonetheless very happy. I put these on and it was like a little bit of heaven. I can stand, cook, exercise, and get around without pain. They make me feel more stable and reduce pain from miniscus tears. I also use the non-neoprene wrap around version for heavy labor and have been able to wrap them around these knee sleeves for extra support. Thank you! It is a little tighter than it has been in the past. I like that the spiral stays aren't too long and poking thru the fabric. Good brace for workout recovery days, walks, and medium to heavy chores. During days when I hike and run mountain trails, I use a Donjoy Adjustable OA Defiance, which I acquired after meniscus surgery 3+ years ago. I wear the Spiral Elastic Knee Sleeve the day after heavy trail workouts, when my knee sometimes needs some extra support and recovery time. I also wear the sleeve when doing medium to heavy chores indoors and outdoors around home, and during lighter walks and exercise. The sleeve gives very good support and compression and remains comfortable during extended use. It does a good job reducing, and sometimes eliminating altogether, soreness I may be experiencing in the knee. My only request would be that the sleeve be made available in some additional color options, such as a medium or dark gray, as the white seems to show and hold on to every trace of dust, dirt, grass - whatever - it comes in contact with. Thanks - it's an excellent brace. I purchased this item because I can't wear neoprene. Was hoping for something to keep my knees a bit warmer in the winter and possibly wear under my Cti braces. These were horrible! DO NOT RECOMMEND!!!! Waste of money. Cons: Stitching at the top and bottom is extremely tight, literally cutting off circulation and rubbing off skin. No matter what, they will slide down, causing the metal pieces on the sides to rub your skin causing sores. Although i followed the sizing & measuring guide, the brace is too small. Should have ordered next size up. It's a little tighter than the last one, but not uncomfortable.